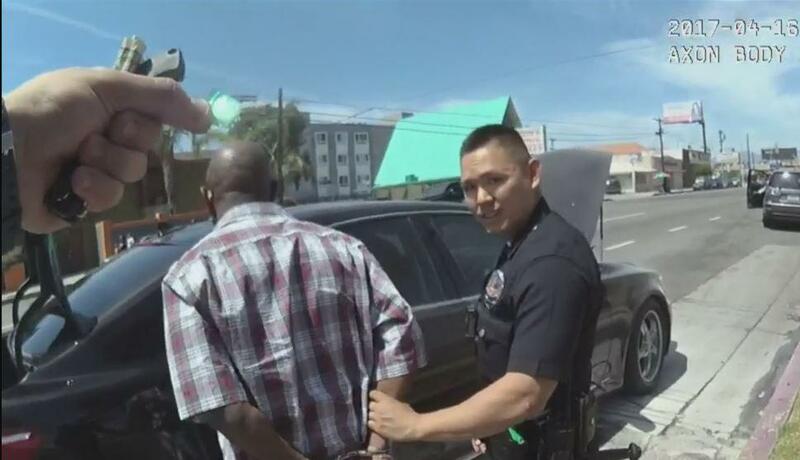 LOS ANGELES -- A body camera video that allegedly shows a Los Angeles police officer planting drugs on a suspect is by itself inconclusive, LAPD Chief Charlie Beck said Tuesday. An LAPD investigation is underway into the video – which first aired Thursday on CBS Los Angeles after being recorded in April – that appears to show Officer Samuel Lee picking up a small bag that later tested positive for cocaine and placing it in the wallet of suspect Ronald Shields. Shields was being arrested for his alleged involvement in a hit-and-run crash. The location of the arrest occurred is unclear from the footage. In the video, a second officer is seen picking up Shields' wallet and showing it to Lee. "The video in and of itself is not dispositive one way or the other, I think that's important to recognize," Beck told the Los Angeles Board of Police Commissioners. Commissioner Cynthia McClain-Hill -- who asked Beck to comment on the investigation -- said she agreed with his assessment that the video was not "dispositive." Ask by CBS Los Angeles about the defendant's claims that the drugs were planted, the commission's president Steve Soboroff said, "I don't believe that for a minute." CBS Los Angeles' David Goldstein reported officers testified the cocaine was found in Shields' left front pocket during a court hearing. The video footage was later used to refute that claim. Shields faces charges of hit-and-run and cocaine possession, Goldstein reported. The arrest video appears to show that Lee turned his camera on after placing the drugs inside the wallet. "I would remind folks that the criminal charges levied against the individual involved here were pretty serious, and they were not restricted to the possession of narcotics and include an ex-felon with a gun and felony hit-and-run," Beck said. Lee has been taken off field duty while the investigation continues, Beck said. The LAPD, at least partly in response to the case, announced changes to its policy on video footage captured by a body camera before the device is activated by an officer, according to Beck. While previous guidelines required cameras to capture the 30 seconds prior to when officers turn on a camera, Beck said the department is extending the "pre-event" buffer to two minutes. He further commented the extension was not due to CBS Los Angeles' report.